Yes, I borrowed the title of a Kate Atkinson book for this post (although if you’re going to read her, I highly recommend Case Histories instead). It is now a full week into the new year (happy 2012!) and this is my first post; I have written others but they did not seem like the right ones with which to begin the year. 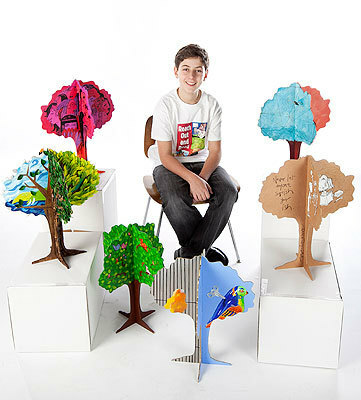 This morning, however, I read an article in the Boston Globe about a 13-year-old Massachusetts boy who contacted artists to create trees, which he would then donate the the nonprofit Reach Out and Read; the organization could auction off the artists’ trees at their annual fundraiser to raise money for early literacy. I wonder if this young person/artist link is catching. There was a young girl here who got artists to donate their work for a fundraiser for our Humane Society – she’d been volunteering there with her mother. And one of those pieces of art is hanging in my house. Anyway, good for the young people!